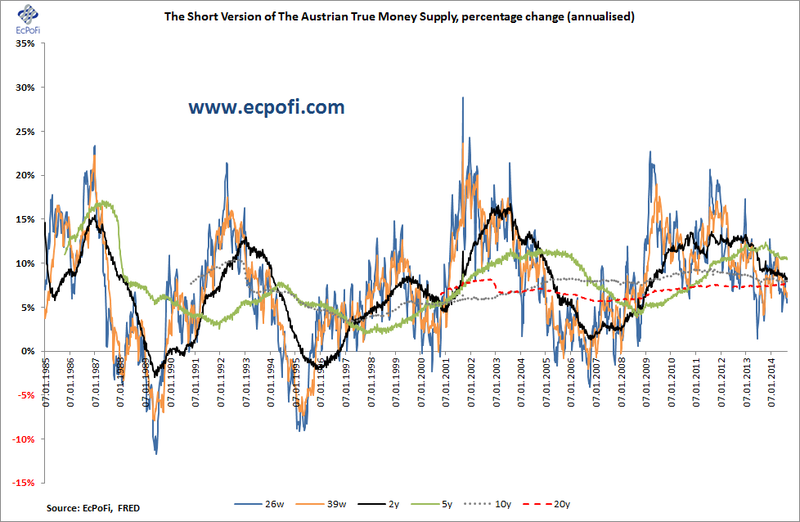 The short version of the Austrian True Money Supply for the U.S., a measure of the money supply applied in this weekly report, increased 0.63% on last week for the week ending 1 September 2014. 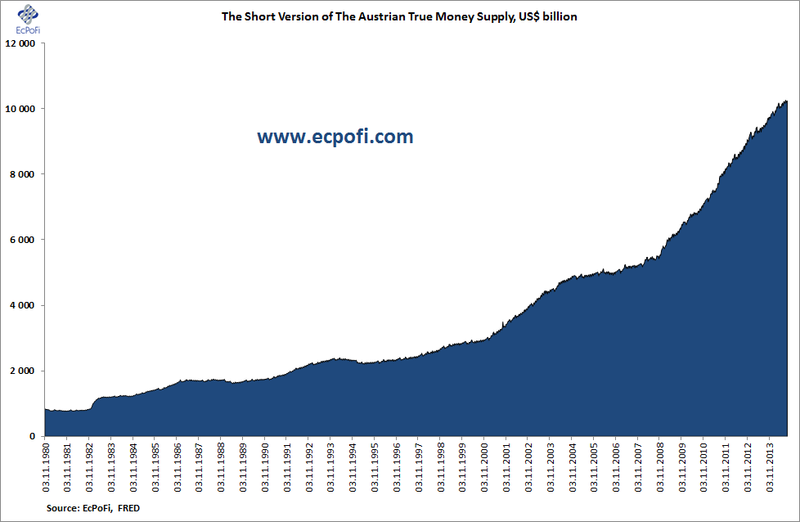 At $10.2470 trillion, the money supply is now up 3.73% year to date, but is 0.19% lower than the all-time high from four weeks ago. The 1-year growth rate dropped further this week ending the week on 7.63%, the lowest since week ending 31 March earlier this year. The change in the 1-year growth rate, measured as the current growth rate minus the growth rate from one year ago (percentage point change), declined for the 114th week in a row. The current difference of 66 basis points is however substantially smaller than it was at the end of last year when the difference was about 500 basis points. 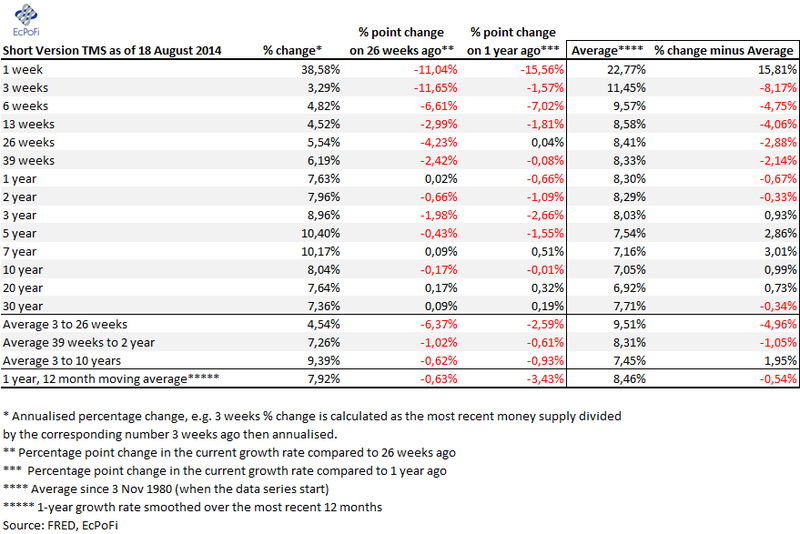 The 5-year annualised growth rate of the money supply shred 14 basis points from last week to end on 10.40%. 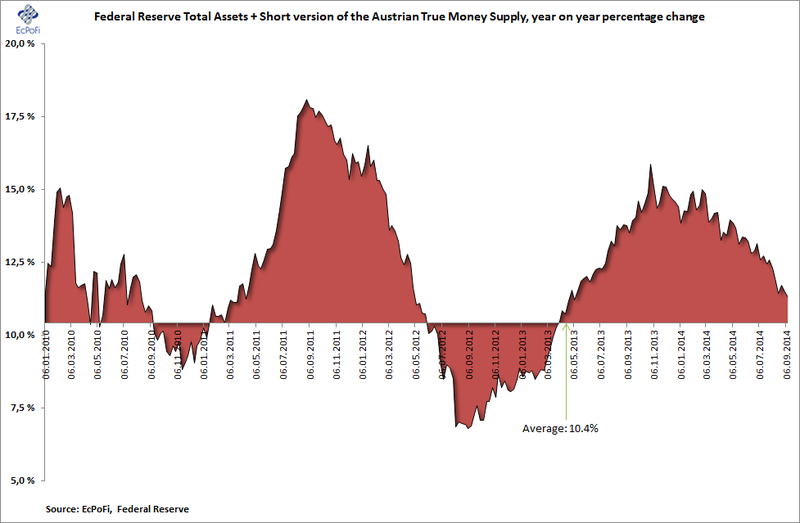 This was the lowest growth rate recorded since week ending 28 May 2012 when it was 10.31%. The rate of change in the 5-year growth rate fell for the 40th week in a row as the current growth rate was 155 basis points lower than it was at the same stage last year. 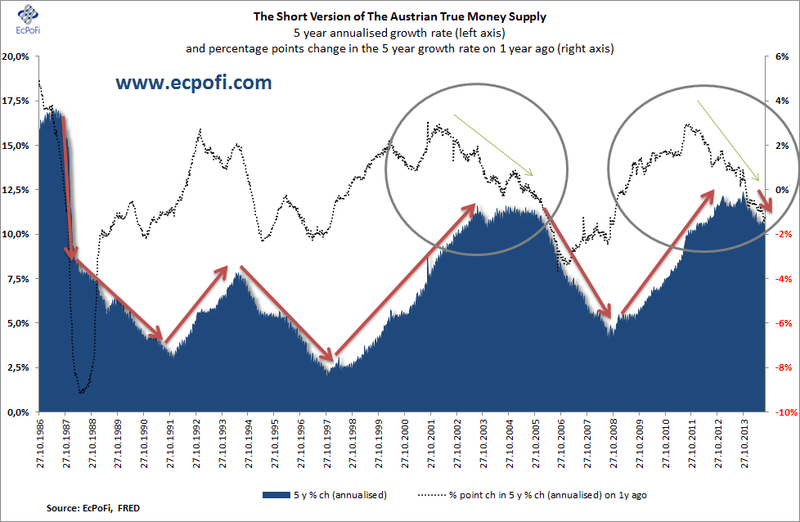 This was the sharpest contraction in the 5-year growth rate of the money supply since week ending 13 October 2008 when it contracted 156 basis points. Add that to your list of risks (or opportunities). 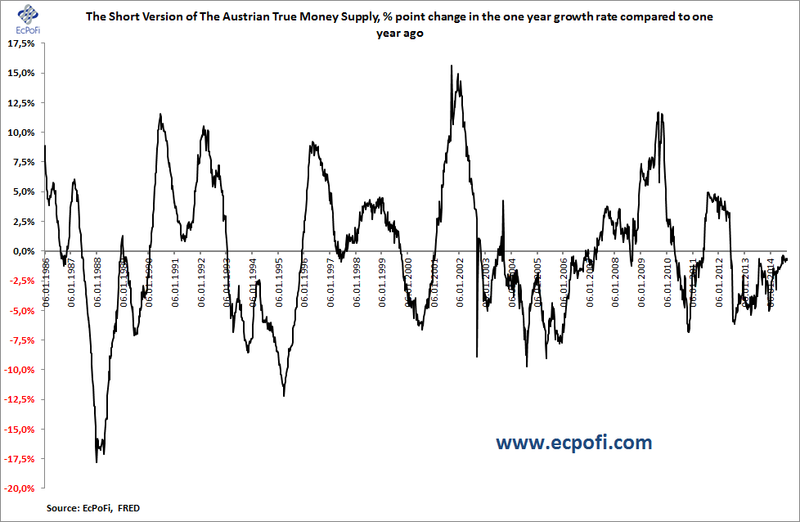 Without getting too technical, another interesting observation is that the percentage point change in the 5-year growth is currently at the same stage it was for the week ending 29 May 2006 (a 155 basis points year on year contraction in the growth rate). 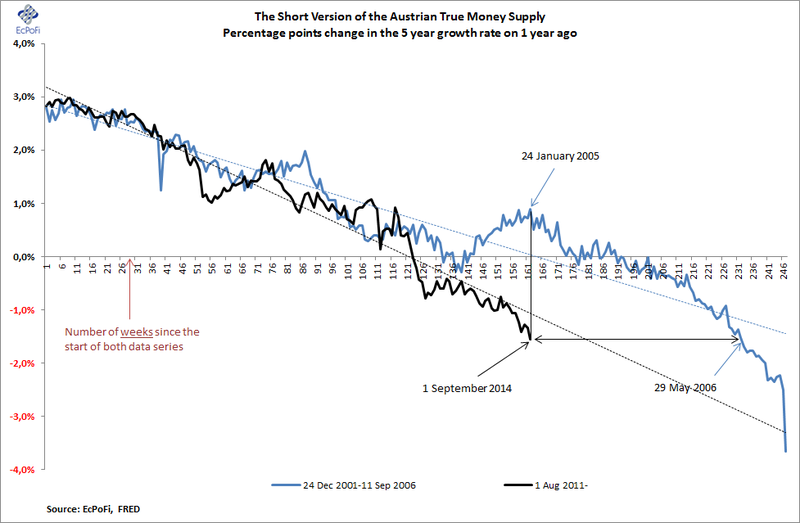 If the growth rate continues to fall from here, and if the 2001 to 2006 "is any guide to the future", this observation could indicate that we are closer to an inflection point (i.e. another crisis of some sort) than if we simply look at the number of weeks the rate of change has declined for the two series (we are currently in week 162). It is of course impossible to make an accurate prediction concerning inflection points, but the decline in the growth rate should be viewed as a risk factor to many asset prices, especially U.S. stocks. 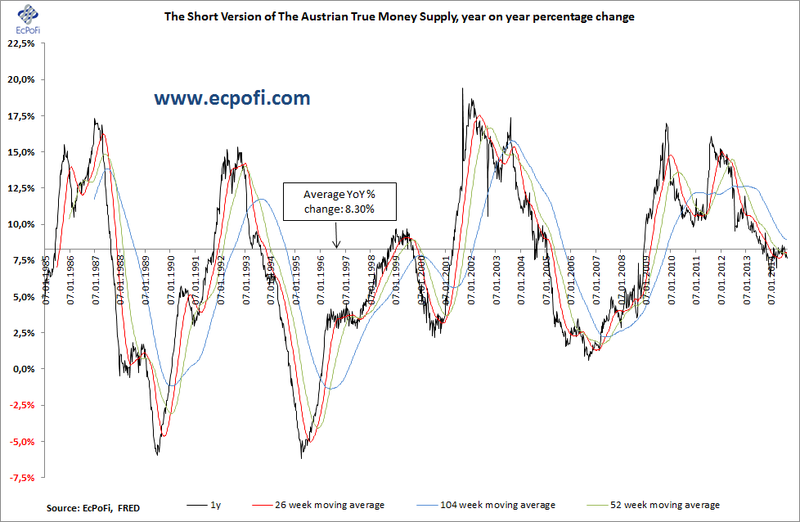 This is very relevant now as the Fed appears to be close to ending QE (for now that is) which by itself will have a negative effect on the growth rate in the money supply and push interest rates up (or less down) as a result. Also, I speculate that there is at least some, though likely small, probability that full-reserve banking (or something closer to it) could be implemented the U.S. soon or sometime in the future, ending fractional reserve banking as we know it. Read the full report here. If implemented and not compensated by the Fed or the U.S. government creating new money instead (in "normal" circumstance, banks create the bulk of the new money through making loans), large deflationary pressures could hit the U.S. economy until a new money relation is established. All else remaining the same, bank shareholders would lose, bank bondholders would gain and the stock market would decline if something closer to a full-reserve banking system was implemented. The U.S. dollar would strengthen (over the longer term) and at least partly offset any U.S. stock market losses (and other nominal asset price losses) for foreign investors. Over the longer term and in real terms, implementing a full-reserve banking system would be a positive for the U.S. economy as it would greatly reduce, if not eliminate, the cycles of artificial booms and very real busts the many have become only too familiar with. Related: The U.S. Stock Market Risk Indicator, August 2014.